Try Our Online Vocabulary Builder For Free! With over 2,850 SAT-level vocabulary words available in The Wizard of Oz Vocabulary Builder and The Pinocchio Intermediate Vocabulary Builder and over 130 vocabulary words available in the free trial, there is no reason for you not to try it out. Start enriching your vocabulary now with our free online vocabulary builder trial. "A recommended and unforgettable skill-improvement tool." "The words stand out both on paper and in memory." "Top Forty List, Best Young Adult Nonfiction"
"An excellent, easy-to-use vocabulary builder that applies the power of storytelling to impress meanings into memory." 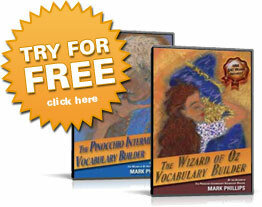 Join Dorothy on her trip to Oz and build your vocabulary the fastest, surest, most natural way ever. Includes 1850 challenging vocabulary words that appear on the SAT, GRE, and other standardized tests. Clear definitions and interesting illustrative sentences appear at the bottom of each page. 400 pages. Click here to learn more or to read a sample chapter of The Wizard of Oz Vocabulary Builder. Join Pinocchio on his amazing adventures and learn another 1,000 intermediate-level PSAT/SAT vocabulary words. Clear definitions and interesting illustrative sentences appear at the bottom of each page. 336 pages. Click here to learn more or to read a sample chapter of The Pinocchio Intermediate Vocabulary Builder. "An absolute 'must-have' for anyone preparing for college entrance exams, and an excellent, easy-to-use literacy improvement resource for everyone else." This book takes all the words from The Wizard of Oz Vocabulary Builder and The Pinocchio Intermediate Vocabulary Builder, plus a few more, and presents them alphabetically in a dictionary/workbook format. Each chapter of 12 words is followed by entertaining word games and puzzles for reinforcement. 480 pages. Click here to learn more or to read a sample chapter of Vocabulary Dictionary and Workbook. The recommended grammar text for middle school and high school students. "I've fallen in love with Tarzan and Jane's Guide to Grammar." Join Tarzan and Jane in the peril-filled African jungle and listen in as Jane teaches the ape-man all about the parts of speech, phrases and clauses, punctuation, and much more. A story-based approach to learning grammar and punctuation. 448 pages. Click here to learn more or to read a sample chapter of Tarzan and Jane's Guide to Grammar. Learn American history just by listening to a lively conversation! If you've ever found American history boring or hard to understand, this book is for you. Inside, a bright, curious student poses questions about American history, and a kind, knowledgeable teacher answers them. Nothing escapes the student's inquisitive mind, and the teacher is endlessly patient. Click here to learn more or to read a sample chapter of Conversations in Early American History: 1492-1837.